The idea of climbing a volcano has a bit of an Indiana Jones air to it – jumping over streams of running lava, dodging flying rocks. Fortunately, or unfortunately (depending on your danger-lust), that’s fairly unlikely to happen. In reality, a guided volcano climb gives you all the exhilaration of summiting a mountain, with the added thrill of geothermal activity. Some come with an element of risk from the activity below their surface, but others are dormant and don’t pose any significant danger to hikers. We’ve scoped out some of the best volcanoes to climb around the world. They range from challenging ascents for serious climbers to easier hikes that any fit traveller can attempt. At 5,897 metres, Cotopaxi is one of the highest active volcanoes in the world (and the highest to make this list). It’s three hours’ drive from Quito, and best suited to experienced climbers. After a major eruption in 2015 the mountain was closed to climbers, and although it has now reopened, check its current status before planning a trip. It requires proper acclimatisation; climbers who are well-acclimatised can climb Cotopaxi in two days: drive or take a bus to the parking area (4,500 metres), from which a shelter is a one-hour walk (4,800 metres). From the shelter, the climb can take up to seven hours, and should be done in the middle of the night to avoid the sun’s melting of the ice and snow at the top. Otherwise, five-day acclimatisation trips to conquer Cotopaxi are recommended, which include other smaller peaks and high-altitude treks in Ecuador. Although the climb is not very technical, it is not easy either, and should be done with a guide. It’s a good way for less experienced climbers to learn about glacier climbing, and the views down into the crater are particularly impressive. Mount Kazbek (5047m) is a dormant stratovolcano, and lies on the border between Russia and Georgia in the Kazbegi National Park in the Caucasus Range. It’s about 100 kilometres from Tbilisi, and there are pretty villages with local accommodation around the foot of the mountain, which make for good bases for climbs and other hiking in the area. Greek mythology has it that it was Mount Kazbek that Prometheus was chained to for eternity in punishment for teaching mankind how to make fire. Attractions of climbing Mount Kazbek include the picturesque Georgian monasteries, hot springs, glaciers, gorges, lakes, and an abundance of birdlife. The regular way that most climbers scale it, from the Georgian side, is not too challenging, but because of its altitude and the need to acclimatise properly, ascent expeditions normally take four days. Iran’s Mount Damavand is the highest volcano in Asia, at 5,610 metres. It is quite strenuous and technical, taking a full day (seven hours up, five down). The final push to the summit is covered in snow, so can be particularly challenging. It’s a popular climb with Iranian travellers, so you won’t have the mountain to yourself, but it’s a good opportunity to make local friends and experience the famous Persian friendliness. There are warm mineral springs at its base, which are a good way to relax after a strenuous climb. Due to its altitude, expeditions to climb Damavand need to spend a few days acclimatising. 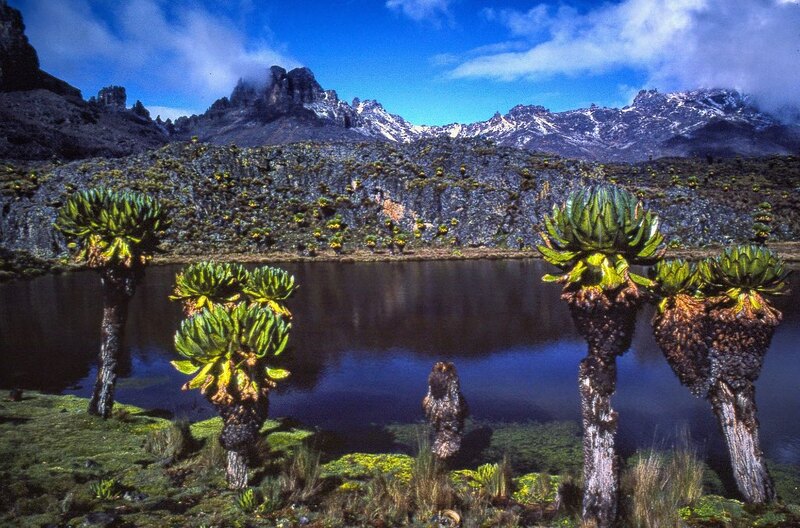 Mount Kenya is the highest mountain in Kenya, at 5,199 metres, and the second-highest in Africa. It’s long been overshadowed by its more famous neighbour, Kilimanjaro, but is gaining popularity among climbers. An ancient dormant volcano, it doesn’t look quite like the classic volcano that you might imagine. But geologists think that it probably did once, and that it was then as high as 7,000 metres. There are three high peaks to Mount Kenya, which can all be climbed, with varying experiences. To trek to Point Lenana (4,985 metres), you only need to be in good hiking shape. To climb the Nelion (5,188 metres) or Batian (5,199 metres) Peaks, you do need to have technical mountaineering abilities. As the mountain is quite accessible and not too challenging, extra care should be taken with the altitude, to avoid rising too high, too quickly. On the Portuguese islands of the Azores, the perfect volcanic Mount Pico rises 2,351 metres on the Ilha do Pico. The trail up the mountain begins at Cabeço das Cabras, and there are 45 marker posts on the way up so climbers can track their progress. Although it’s not exceptionally high, it is a surprisingly challenging climb. It is very steep, and the weather can change dramatically and quickly. While you don’t need to be an experienced climber to trek to the top of Mount Pico, good fitness is definitely a bonus. If there is snow at the top you will need crampons, or the help of a guide. At the top is a 500-metre wide, 30-metre deep crater, which is an awesome sight to look down into. Africa’s highest mountain, Tanzania’s Mount Kilimanjaro is 5,895 metres high. The dormant volcano is comprised of three volcanic cones. Although it’s a popular mountain climb, it’s actually pretty challenging, and shouldn’t be taken lightly. The high altitude and rapid ascent catch out many unprepared travellers. The trip takes five days and must be done with a guide. A variety of route options are available, all with incredible views of the plains of East Africa. Many people combine a Kilimanjaro climb with an animal-spotting safari in East Africa, and this certainly makes for an all-round enjoyable holiday. Mount Rinjani is the second-highest volcano in Indonesia, at 3,726 metres, but what Indonesian volcanoes lack in height, they make up for in activity. The volcanoes of Indonesia are very active, so it’s important to keep up-to-date with safety situations when planning to climb Mount Rinjani. 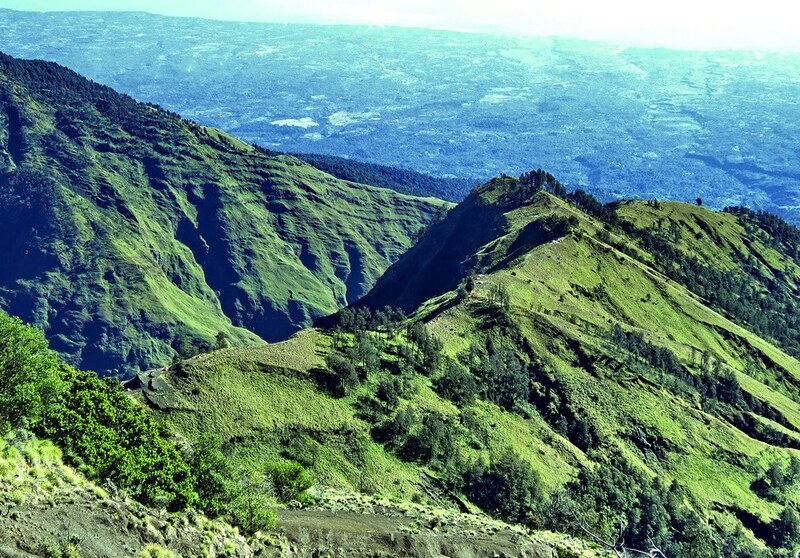 Rinjani is on Indonesia’s Lombok island, east of Bali. Although it’s often advertised as a trek, reaching the summit should be considered a climb, and only attempted by fit travellers with plenty of trekking experience. It takes two days, but the ascent is rapid, on steep and slippery trails. It’s a tough hike to the crater rim, but the view from there is incredible: turquoise Lake Segara Anak below, lush green valleys, and active volcano Mount Barujari on the edge of the lake. There’s no mistaking Mount Ijen for a sedate, ‘ordinary’ mountain. This volcano is very active. The 2,799-metre peak in East Java is the site of a sulphur mine and is frequently closed to climbers and workers because of its noxious gases. 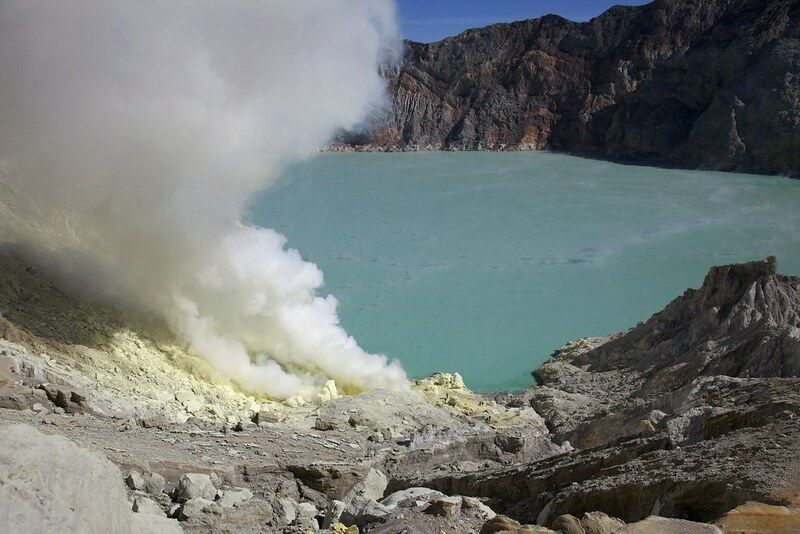 But, if this sounds thrilling rather than terrifying, and you’re prepared to hike with a gas mask just in case, then climbing Mount Ijen is highly rewarding. Treks normally take three days. Ijen sits within a 20-kilometre wide caldera, and features the world’s largest hyper-acidic lake, bright turquoise and highly photogenic (although not safe for swimming!) Other highlights are the otherworldly night views, as a blue fire burns as gases emerge from the volcano, and the sunrises over the many peaks sitting within the giant caldera. If this all sounds a bit much, early morning trips to watch the sun rise over Mount Bromo, Ijen, and other peaks are fun and can be enjoyed by anyone. The Tongariro Alpine Crossing in the central North Island of New Zealand is widely considered to be one of the best day hikes in the world. Tongariro (1,975 metres) itself is an active volcano, and sits on the northern end of the Tongariro National Park. Mount Ngauruhoe (pronounced now-ruh-hoe-ee), aka Mount Doom from the Lord of the Rings films, is a 2,287-metre volcanic peak that rises perfectly amid the moon-like landscape of the trekking route. Fit, fast hikers have long enjoyed taking the two-hour detour up steep scree to scale Mount Ngauruhoe. However, we’re asking you not to. The peak is sacred to the local Maori people, and the New Zealand Department of Conservation asks hikers to respect that and not climb the volcano itself. 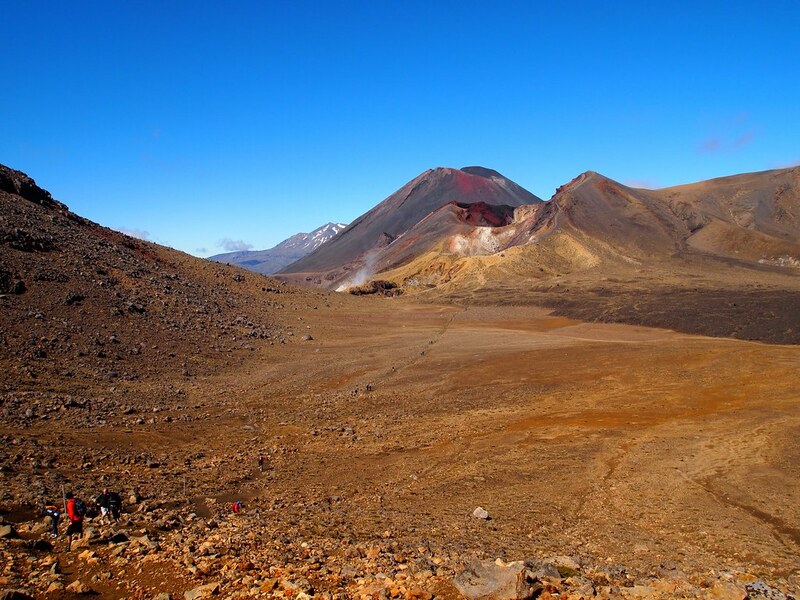 The Tongariro Alpine Crossing is a highly worthwhile trek on its own, with bright turquoise sulfurous lakes, barren cratered landscapes, as well as dense forest. Ngauruhoe can be admired from its foot. The challenging two-day climb of Mount Acatenango (3,976 metres) is one of Guatemala’s most popular treks. Acatenango’s neighbour, Fuego, is continually erupting and makes for a great backdrop – especially from your camp at night when you’ll see a show of lava. In fact, Acatenango is just one of a chain of active volcanoes, which you will see from the top. Parts of the climb are a scrabble over scree, and don’t forget to take a torch or headlamp to climb to the summit at sunrise. The climb can be particularly tough, especially when the weather turns, and visibility goes to pot, so should always be attempted with a local guide. However, the views of the chain are spectacular, especially at sunrise and sunset, both of which an overnight trek will let you experience. Explore our collection of summit-bagging trips and other epic trekking holidays with hand-picked local guides and hosts.